Last month, our friends at Three Olives invited us on a day trip to Palm Springs as part of their #FindOtherness campaign launch. First introduced in London in 1998, Three Olives was acquired by Proximo Spirits in 2007. Made in England, Three Olives produces a clear, unflavored vodka and uses the circulation method to flow vodka into flavored liquids to produce a wild mix of flavored vodkas. With varieties like fresh watermelon, cucumber lime, espresso and mango, Three Olives is all about embracing the flavor road less traveled. The mixing potential of these quirky spirits is pretty epic, as we found out during our day trip. 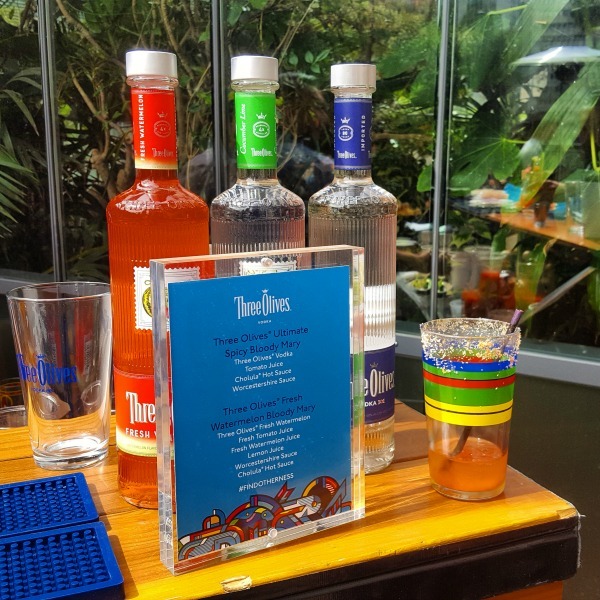 Our mission started out at The LINE Hotel on Wilshire, where we first got to sample the mixability of the Three Olives line. I went with the fresh watermelon Bloody Mary, which included watermelon juice, Three Olives Fresh Watermelon, tomato juice, lemon juice, Worcestershire sauce and Cholula. It was a pretty unique take on a classic morning cocktail. After this first sample, we piled into the Three Olives #FindOtherness bus and began our trip to Palm Springs. The #FindOtherness visual aesthetic was part of a collaboration with Van Orton Design, twin brothers from Italy who dabble in design, illustration and music. Their colorful, kaleidoscopic style was on full display when we first met our transportation for the day. After hitting the road, we were treated to some great tunes by KAT V, a classically trained electric violinist who combines DJ mixing skills with an additional layer of live instrumentation. It made for a particularly nice ride. On the road to Coachella, we made a stop at Tio’s Tacos in Riverside to take in the eclectic collection or art and artifacts on the grounds, grab some grub and try some agua frescas cocktails. Pineapple Three Olives with papaya agua fresca and Pink Grapefruit Three Olives with orange were two of my favorites. All the options were awesome, though. Three Olives flavored vodka is like a mixer with a kick. It doesn’t need an extra active ingredient. It allows for maximum combinations while encouraging experimentation and creativity. Think Coconut flavored vodka mixed with Horchata. We rolled into Palm Springs and met up with two additional contributors to the #FindOtherness campaign. Singer-songwriter Halsey spent some time with our group while dishing out fashion styles from a pop-up thrift shop. The goal was to get people to embrace some festival fashion otherness in prep for Coachella. I got a pretty cool Duran Duran pin, but I also got to talk to Halsey and designer/visual artist Ron Bass. Halsey and I talked about her brand collaborations. I knew she did work as a Modern Icon for The Frye Boot Company, so I was curious to understand how these brand collaborations came about. With Three Olives, it was a personal connection with her friend Erin that first put the #FindOtherness campaign on Halsey’s radar. The more she learned about it, the more interested she got. “A campaign that’s about identifying and celebrating individuality,” Halsey said, is what gravitated her to the brand and the project. “Especially right now at a time when it’s really difficult for brands to be political, but they still want to say something that’s motivating to people and comforting. I thought Find Otherness was a good mentality as far as surmising the idea of celebrating your peers and your neighbor for their differences and seeing that as a positive and something beautiful,” she explained. “So the collaboration came together really organically in that way. I was going to be here, at Coachella, and I love the company and it just seemed like a great way to work it out. When they told me they would be bringing people in and letting me style them, I was sold. If I can put cool clothes on people, then I’m super down,” she told me. With a variety of Three Olives bottles lining the windows of the bus, it was a fun ride back to LA. While I may be a bit more of a beer and whiskey guy, I can understand the appeal of flavored vodkas that lend themselves well to imaginative, DIY cocktail creations. From the decorative party bus powered by Van Orton Design, to the eclectic beats of KAT V, the mobile art gallery that is Ron Bass fashion and the pro-weird vibes of Coachella vet Halsey, Three Olives checked a ton of quirky boxes on their #FindOtherness campaign launch. It was a smart start for a campaign with a cool message. Print article This entry was posted by Chris Stout on May 11, 2017 at 4:09 pm, and is filed under Lifestyle. Follow any responses to this post through RSS 2.0. Both comments and pings are currently closed.